Joseph Fram was born June 8, 1932 in Las Vegas, New Mexico, the 5th of 6 children of Pat and Jennie Fram. He had 4 older sisters: Mabel, Stella, Elizabeth and Helen, and one younger brother, George. He was raised in Las Vegas, spent 2 years in the Army, and went to college in New Mexico, graduating with a 3.99 GPA and receiving his Master's Degree in 2 years. He got married and moved to Seattle, Washington, (where his daughter, Dana, was born), to Spokane in 1958 (where his son, Dale,was born), and to Yakima in 1964. Joseph was appointed to be superintendent of Yakima Valley School, a residential school in Washington state for the multiply-handicapped and severely retarded, for 22 years, from 1964 until his retirement in 1986. He was the youngest person in Washington to become superintendent of an institution, at age 32. Joseph Fram and a colleague, Paul Stemmer, had an idea in the early 1960's to create a type of sports competition for handicapped children, so they could participate in similar activities as their peers. They met with Eunice Kennedy Shriver in Tacoma to discuss their idea. After hearing this idea, she invited Joe Fram to meet with President John F. Kennedy and share the idea with him. From that meeting with the President and his sister, the Special Olympics were born. President Kennedy also quoted from a paper written by Joe Fram in one of his speeches on TV. When Joe Fram became superintendent of Yakima Valley School, the residents were mostly confined to beds or cribs. The building was an old tuberculosis hospital, dreary in color and a quite depressing place to visit. Joe Fram did not think this was an adequate atmosphere for children to live and grow, so he remodeled the place. He brought in artists to paint the walls a more cheery color than institutional blue and green, and to paint a giant mural in the lobby with cheerful children going through the seasons. He had a swimming pool built for recreation, and, most importantly, he got residents out of their beds. For the residents who were apt to injure themselves, he had them fitted for helmets to protect their heads. If their legs were too weak to support them, he had large walkers for them. Every resident who was able to get out of bed was liberated. He brought in students and volunteers to sing to the residents. He had individual education plans created for each resident, acknowledging that everyone can accomplish something and didn't need to be compared to anyone else. Each person had his own goals and achievements. He encouraged the residents to be as independent as possible, although all were in need of assistance, either physically or mentally. He worked with co-workers to form Yakima Specialties, a company that employed handicapped and disabled citizens. He worked with the community to get adult residents moved into group homes. His dream of getting the residents out of the old hospital building and into specially made cottages was realized in 1986, just before he retired, when the cottages at Yakima Valley School were dedicated. Just 3 years after retirement, in 1989, Joseph Fram was diagnosed with prostrate cancer and doctors told him he had just two years to live. Through the miracle of prayer, he was given back his life in the summer of 1990. In 1992, he and his wife, Dixie, separated. They were divorced in 1994. Through the pain and suffering of these two life-changing events, Joe Fram sought God. He began to write poetry as a way to come to terms with his situation: thus began his journey. Joe Fram has been an avid bowler (once bowled a 300 game! ), golfer (has had 2 hole-in-ones!) and hockey player/ice skater for most of his life. He also enjoyed slow pitch softball - he was the pitcher. He has traveled the world extensively, visiting China, Russia, England, Spain and Mexico, among other places, with his dearly beloved Doreen, who passed away in 2010. His 5th book deals with the struggles of suddenly becoming full-time caretaker of a loved one with Parkinson's disease. 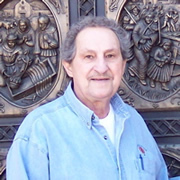 As of 2012, Joseph Fram has written 8 poetry books documenting Joseph's Journey, all of which are available on this website. He is working on part 9 of his 'journey' through poetry. Joseph Fram currently resides in Washington State.